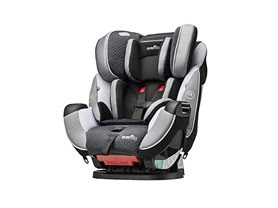 Right now get this Evenflo Symphony DLX All-In-One Car Seat for only $139.99 (Retail $229.99)! This All-In-One seat accommodates children ranging from 5-110 pounds and as the only car seat you will ever need,and is the best value on the market. Symphony DLX provides exclusive safety features including Sure LATCH technology; you simply Click, Click, Push for a super-fast and super-snug installation in less than 60 seconds. e3 Side Impact™ Protection significantly reduces side impact crash forces up to 50%. through an expanded zone of protection and 3 layers of superior protection. Gel Matrix ™ designed to keep you child content; dialing up the level of comfort with the introduction of Gel Matrix Technology. This engineered material reduces pressure point build-up, alleviating child's discomfort for a safer, more peaceful ride. Integrated cup holders for easy access to drinks.